EasyLab is a FabLab / Makerspace management system that heps standardizing Business and Models Operations giving free access to the FabLab and asking a fee for every machine used. Mattia: what about the main actions done to improve the project? Murat: to arrange a cloud system of access to the FabLab machines. Mattia: what you do thanks to this implementation? Murat: they can use the system to monitor the use of the machines (who use and when that machine? ); simplify the reservation management system and b on users (to map skills of users and create networks between professionals). Mattia: what you need now? Murat: we need to work on network implementation in order to optimize the cloud system. We want to implement features available to makers too, lower production costs and train new teachers through mentoring. The aim of FabLab Hub is to let FabLab Firenze be a shared platform for independent and specialized knowledge holders to form a network beneficial to everyone. Murat: what about FabLab Hub core activities? Mattia: our system is self-sustaining through membership, education and project design. Murat: how do you manage them? Mattia: after an initial phase in which we tested a horizontal management model, with unsustainable results, we changed course and decided to undertake a more vertical strategy, based on less collective decision making. So, for instance, our courses usually focus on basic activities, for those who wish to learn more, is possible to ask the advice of a mentor, having more session, renting our spaces for more ours. 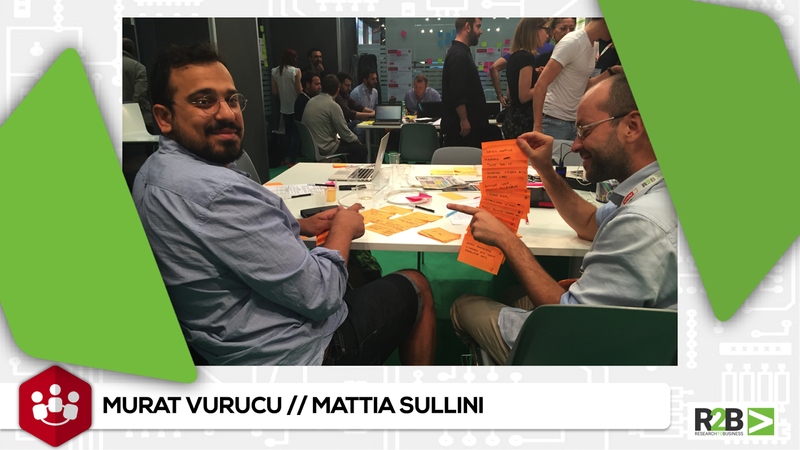 Murat: and what about your activities on project design? Mattia: companies commission us projects which can involve a single professional or even all professionals in the FabLab. Every professional working on a project earns a fee for his performance, the rest of the profits are reinvested in the FabLab. After one hour interviews between an italian and a German project, now it’s time for the pair to join the other community table participants and exchange their experiences on what they have learned from this activity.